The Carolina Rose pine waterbed headboard with antique rose color glass design and roomy storage cabinets, offers a distinctive difference from all other headboards. 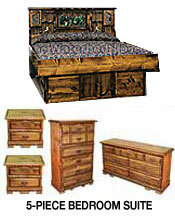 Includes headboard, frame, deck boards, and standard 9.25" Pedestal, or choose other options below. (Shown with 18" optional Captain Pedestal available below). Available in Honey Oak, Unfinished or Walnut finish. 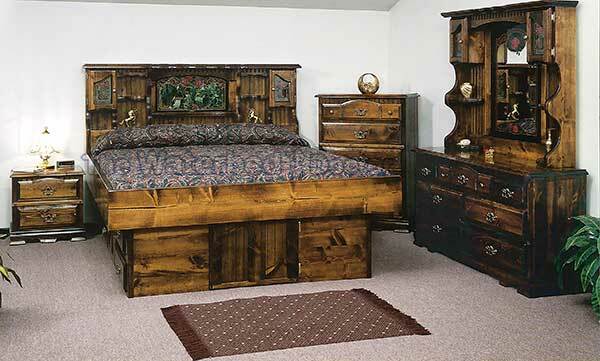 5-PIECE COMPLETE BEDROOM SUITE - SAVE $300! The Carolina Rose headboard comes with frame, deck boards, and Standard Pedestal. FREE Free Flow Mattress, Fill & Drain Kit, Liner & Heater. PLUS MATCHING CHEST, DRESSER & 2 NIGHTSTANDS! BUILD YOUR BED HERE USING DROP DOWN SELECTIONS. The Carolina Rose headboard comes with frame, deck boards, and Standard Pedestal. FREE Free Flow Mattress, Fill & Drain Kit, Liner & Heater. All Made In The U.S.A.